To most people, squid are calamari—delicious when fried. But to Max Kaplan and Aran Mooney, squid are linchpins of the ocean, and another reason to be concerned about climate change. Kaplan and Mooney investigated whether the ocean’s changing chemistry might affect the developing eggs and hatchlings of the common Atlantic longfin squid. Unfortunately, the answer is yes. “We found impacts to very young squid, the foundation for future populations,” said Kaplan, a graduate student in the WHOI-MIT Joint Program in Oceanography. “This could have negative implications for ocean food webs.” And for humans, since squid fisheries in the United States are worth about $100 million a year. As fossil fuel burning adds more carbon dioxide (CO2) to the atmosphere, the ocean absorbs the excess and becomes more acidic, reducing the concentration of carbonate ions in seawater. Many marine animals need those ions to build hard parts, such as shells, so ocean acidification could make life more difficult for ocean life. Squid use calcium carbonate crystals to make balance organs, called statoliths, that provide the ability to orient themselves when swimming. 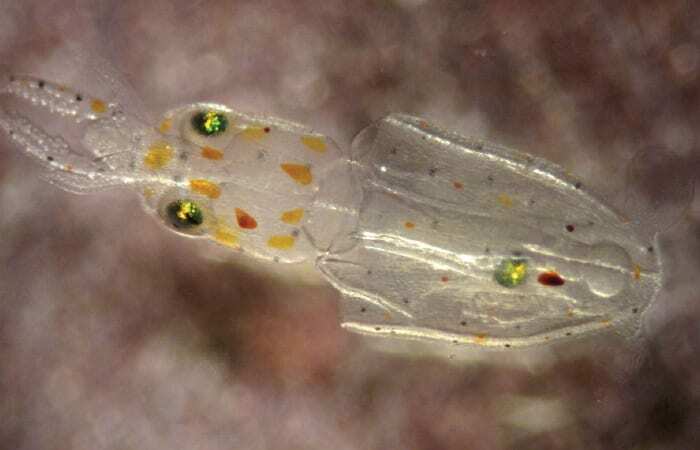 Would acidification affect larval squid and their statoliths? Mooney and Kaplan wondered. The scientists collected squid, held them while they laid egg masses, then transferred the eggs to experimental tanks—one with seawater at today’s CO2 levels and one with higher levels predicted for the century’s end. “Animals raised in high CO2 took longer to develop, which is a big deal when you’re basically this egg mass on the bottom of the ocean and fish can just pop along and eat you,” Mooney said. 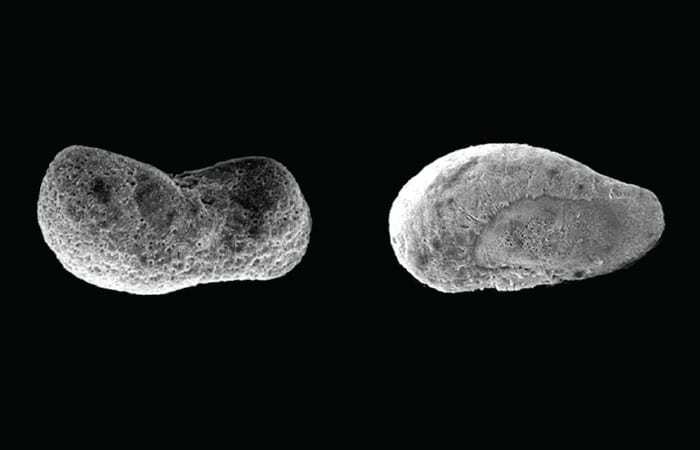 Furthermore, hatchlings in more-acidic water were an average five percent smaller than those in normal seawater, and they had misshapen, disorganized statoliths. “The animals probably had a challenging time laying down those crystals,” Mooney said. “It doesn’t look like they can do that in a very orderly fashion in high CO2 because the acidified conditions keep dissolving the calcium carbonate as the animals are trying to lay it down.” Misshapen statoliths could impair hatchlings’ ability to swim, avoid predators, or find prey. Kaplan and Mooney, working with WHOI colleagues Anne Cohen and Dan McCorkle, published their findings in May 2013 in the journal PLOS One. Continuing the research, graduate student Casey Zakroff is rearing squid in tanks with a wider range of CO2 levels. The aim is to ascertain specific thresholds when acidification begins to affect hatching time, hatchling size, and the hatchlings’ yolk sacs—the critical energy source they rely on to develop and grow until they can capture prey. The research was funded by the WHOI Summer Student Fellowship Program and WHOI-MIT Joint Program, the Penzance Endowed Fund, the John E. and Anne W. Sawyer Endowed Fund, the National Science Foundation, and the NOAA Sea Grant Program.